The Rainbow Tenors consists of 3 fine gentlemen namely Paul Dalasile, Fizile Magazi and Mpho Phasha. Paul was born in 1983 and attended Nkgopoleng Senior Secondary School and completed his matric there. Fizile was born in 1984 and attended Iketsetseng comprehensive School. Mpho was born 1982 and also attended Iketsetseng. Three young gentlemen who were all at different schools and singing in their respective school choirs (each was a soloist and had often competed against one another) got together as a trio in 1999, under the banner of the Sasol Music Choral. The group originates from Sasolburg which may be part of the reason why they have been described as being “fuelled with passion for developing their talent”. These young Tenors have completed their voice art training with distinction at the Vaal Technicon and are currently busy with their Honours. The Northern Free State District Government has supported and sponsored these dedicated young Artists through their development. 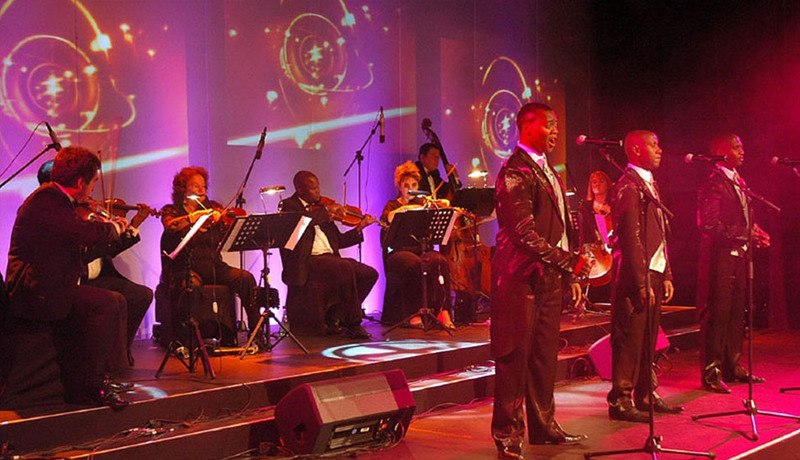 The group performs at weddings, Gala dinners, funerals and other formal events. They have also performed at the Aardklop Festival in Potchefstroom. They have performed at numerous events such as SA Women in dialogue in Pretoria, World AIDS Day, Matric World EXPO, World Productivity Congress and the Department of education Initiative (all held in Bloemfontein), many events for Sasol and a number of other performances, some of the more recent performances include FNB awards, Discovery, Clientele life year end, Auto & General, Samsung gala dinner, Essential National Trade Show and their crowning glory thus far; the opening of Soccer City on 22 May 2010, They also performed for the International Launch of the Tasly Alliance in August 2010. And together with extreme violinist Caitlin Papier, The Rainbow Tenors shot a music video at The Silverstar Casino, the Fountain on 31 December 2010 and will be releasing a music DVD in the 1st quarter of 2011. Rainbow Tenors currently assist the choirs at their local schools and churches to read score and train their voices. Their mission is to improve the standard of opera and classical performance in rural areas. This is highly commendable, considering their own impoverished circumstances.